Watch the Culture II visuals now. Migos have shared the cinematic new visuals for Culture II single "Stir Fry." The video catches the group playing dominoes with producer Pharrell in the back of a restaurant. 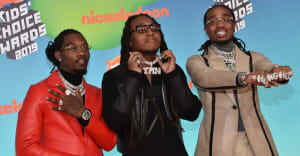 When a bloody hand is thrown through the window Quavo, Takeoff, and Offset take it upon themselves to seek vengeance and show off their martial arts moves. Culture II dropped on January 25 and features Drake, Cardi B, Nicki Minaj, Big Sean, Travis Scott, 21 Savage, and Gucci Mane among others. Production credits include Pharrell, Metro Boomin, Zaytoven, and Mike Dean with additional production from Kanye West.